The Snowman, the captivating tale of a young boy who wakes one snowy Christmas Eve, goes outside and discovers that a snowman he built has magically come to life, first appeared as a children's book by British author/illustrator Raymond Briggs in 1978. A 26-minute animated film adaptation of the story was released in 1982 and nominated for an Academy Award in the Best Animated Short Film category that year. Both book and film are told wordlessly through images. 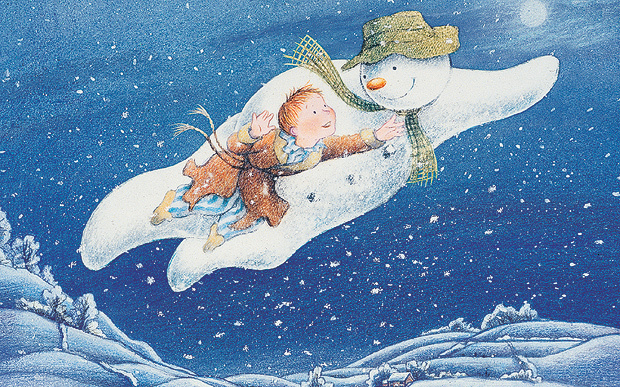 The film is also blessed with Howard Blake's (The Duellists, The Hunger) evocative score and the haunting song "Walking in the Air" to accompany boy and snowman as they frolic in the hours before Christmas dawns. 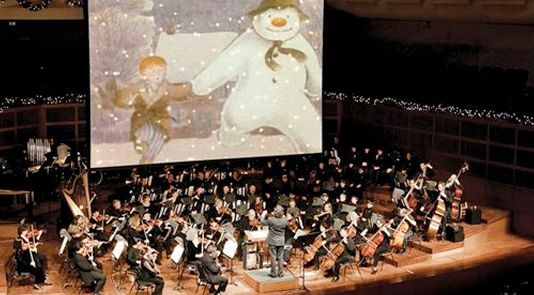 This year symphonies all around the U.S. are showcasing The Snowman with orchestral accompaniment as part of their holiday season programs. In San Francisco, the Symphony will perform the score live as the film screens on Friday, December 16, Saturday, December 17, and Sunday, December 18; Christmas songs, performed by Ruthie Ann Miles, the Pacific Boychoir and the Symphony, are also part of the program. Click here for more information. Many thanks to the San Francisco Symphony for press tickets to this event! "The Snowman" deserves to be a holiday classic, if it already isn't - when my kids were small we watched it every Christmas (we still love it). The movie captures a magical atmosphere and the unguarded sweetness of childhood - what makes Christmas special. Such wonderful animation, and the score is a major reason this movie is unforgettable. A live musical performance should make for a great Christmas experience. In my view "The Snowman" is a certifiable Christmas classic - the story, visual presentation, music. Interestingly, the original book wasn't Christmas-oriented, no Christmas tree in the house, no visit to Santa Claus. Thanks for the heads up! I'll have to check if its coming to Cleveland. Great opportunity with the symphony to bring up this classic aanimation Lady Eve. I first bought the book when it was published, as I was collecting "classic" picture books" then. Raymond Briggs is one of the great modern English illustrators.Thank you for your fine tribute. It was a lovely program, Christian, and the high point was the Pacific Boychoir singing "Walking in the Air" to the accompaniment of the SF Symphony.